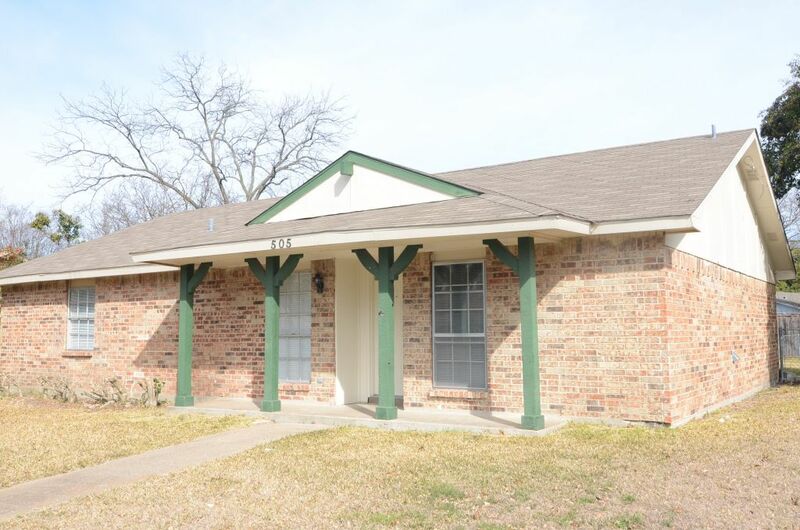 Hilites Four bedroom house near South Garland High School. New carpet and vinyl. Freshly cleaned, painted and repaired. Large living den with a fireplace. Breakfast area in the kitchen. Extra room could be a living room or formal dining room. Walk to 12 grades of Garland schools. Appliances: Stove, dishwasher, working refrigerator in the kitchen but owner will not repair. Hookups for full size washer-dryer. Central heat and air. Terms: 1. Minimum 12 month lease. 2. Tenant pays utilities and takes care of the yard. 3. Prefer no pets. Deposits start at $500 if accepted. 4. There is a trampoline in the back yard, left by prior occupant. We can leave it in place or discard it but Landlord will not make any repairs nor take any responsibility for its function. Any use of it would be at Tenant's discretion and risk. Showing:We qualify before we show. First drive by the property and see if it is what you had in mind. If you want to go inside, we ask for an application. There is no fee if you come into our office at 10729 Audelia in northeast Dallas. You can apply online for $40 by going to our onsite application . Misc: Two-car rear-entry garage. No automatic opener. Fenced back yard. Built 1971. Public school district: GISD .